With hundreds of Christmas cards to write, family and friends to visit and business deals to finish, your workforce have got a lot on their minds, and as a HR representative, you’re likely feeling the pressure too. So, with your to-do list already longer than Santa’s, we thought we’d take a few tasks off your hands..
To ensure every one of your employees finds the perfect balance between their work and home life well into 2019, show them you respect their interests. How? 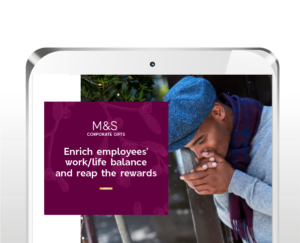 Empower them this Christmas with an M&S gift card, and give your business the gift of greater productivity, innovation and creativity.